Brushing our teeth has been a hygienic and social necessity for hundreds of years. Toothpaste has come a long way since the 1800’s when it was sold in a tasteless jar. Now every flavor from fresh mint to blueberry bubblegum is available while simultaneously meeting your every dental need. How many times have you sat in the toothpaste aisle, stumped on exactly which brand to buy? With so many choices available, it can be a tough decision to decide which toothpaste is the most beneficial for you and your family. What exactly are we putting into our mouths multiple times a day? Do toothpastes really do what they say they can do? If the American Dental Association Seal of Acceptance is on the label, then the answer is yes. 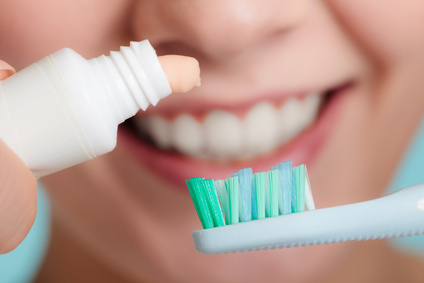 The following is a list of common ingredients found in toothpastes and what their purpose is. Toothpaste otherwise known as dentifrice is the paste or powder used to clean your teeth. Without added flavoring it tastes pretty bland if not awful so it’s generally coupled with a certain flavor to mask the bitterness. Toothpaste comes in the form of powders, gels or pastes with the purpose of removing plaque – the bacteria that forms on your gums and teeth. Deciding between paste, gel or powders is more of a preference than a necessity. Mild abrasives to remove debris and residual surface stains. Examples include calcium carbonate, dehydrated silica gels, hydrated aluminum oxides, magnesium carbonate, phosphate salts and silicates. Fluoride to strengthen tooth enamel and re-mineralize tooth decay. All ADA-Accepted toothpastes contain fluoride. Humectants to prevent water loss in the toothpaste. Examples include glycerol, propylene, glycol and sorbitol. Since the early 1900’s, fluoride has been arguably the most effective and valuable component in toothpaste. Dr. George Stookey of Dear Doctor Dentistry shares, “Its purpose is to strengthen the tooth’s enamel while while making the tooth more resistant to decay. Fluoride is actually incorporated into the enamel structure. If the enamel surface of a tooth is exposed to acid either ingested or produced by oral bacteria, the affected surface can absorb fluoride if present, thereby helping to reverse the process. This not only “re-mineralizes” the affected surface, but actually makes it stronger and more resistant to acid attack (with repeated and frequent application).” We’ve all read the controversy around fluoride – is it safe or not safe? The ADA only approves effective and safe ingredients in toothpaste. Years of studies have shown that fluoride is safe both for adults and children and have no adverse effects when used as recommended. Excessive use of fluoride can cause staining so be sure to follow manufactures directions. – One of the main goals of a daily brushing routine is to ultimately diminish the build up of plaque which is formed by bacteria in our mouths. Ingredients such as zinc citrate and pyrophosphates will help keep the tartar in check. – We’d all love to have a bright smile. To give your teeth a smooth shiny glow, look for toothpaste with carbamide peroxide or hydrogen peroxide. The more abrasive a paste is, the more it will polish your teeth helping to remove stains. If you are interested in a deeper whitening process, contact our office today to set up a consultation with one of our dentists at Sol Dental. – We all experience sensitive teeth from time to time but do not let this stop your from your daily brushing routine. Look for toothpastes that contain strontium chloride or potassium nitrate in them. Using a paste with these ingredients will help reduce sensitivity over time. Using plain baking soda has shown to help improve sensitive teeth. Don’t be afraid to explore different brands to find the right toothpaste for you. Stick to ADA approved products and focus on toothpaste that meets a particular goal such as healing gum disease, controlling plaque buildup or dealing with sensitivity issues. As always, feel free to contact our office with any questions or concerns you may have. We have all types of toothpaste recommendations for you and your family.